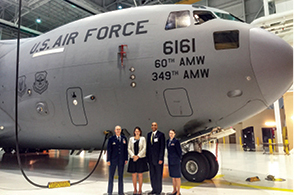 In 2016, Two NorthBay senior managers became Honorary Commanders at Travis Air Force Base. Aimee Brewer, president of NorthBay Medical Group, was sworn in to serve with Col. Mark Coakwell, left in photo, commander of the 60th Aerospace Medicine Squadron. Meanwhile, Konard Jones, president and CEO, became honorary commander of the 60th Diagnostics and Therapeutics Squadron and worked with Col. Anderson Rowan. Konard poses with Senior Airman Nicole Leidholm, at right in photo. She was standing in for the colonel at the ceremony.